The founder of the Waterstone's book chain, Tim Waterstone, has offered to buy the business from its current owner HMV for £280m ($501m). However, the offer is dependent on HMV not buying or offering to acquire rival bookstore chain Ottakar's. Last month, the Competition Commission provisionally backed a takeover of Ottakar's by HMV. HMV had agreed to buy Ottakar's for £96.4m, but the offer lapsed after it was referred to competition watchdogs. Mr Waterstone said bank finance had been arranged "in principle", and the new firm would be chaired by himself and have former Penguin UK head Anthony Forbes Watson as its chief executive. 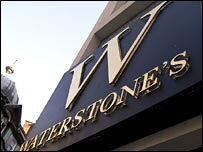 The indicative offer for Waterstone's had first been put to HMV in February. "This is a very fully-priced offer for a business which faces major challenges to recapture the market share and operating margin that have been lost," Mr Waterstone said. "Much of the upside that we hope to create in Waterstone's would be passed to HMV shareholders under the terms of this offer." Last year's bid by HMV for Ottakar's attracted much criticism from the publishing industry, with many arguing that if the deal went ahead it would restrict choice on the High Street. Although HMV's original bid for Ottakar's has lapsed, now that the Competition Commission has given the green light to such a deal analysts are expecting a second offer. However, Mr Forbes Watson said he thought it would be a "mistake" if HMV bought Ottakar's. "There is a tremendous opportunity to re-energise a wonderful brand and to re-establish Waterstone's at the hub of the UK book world," he said. "Recovery at Waterstone's is the priority and the acquisition of Ottakar's would present a perilous distraction from this objective, bringing the additional risk that apparent synergies would not materialise." In March, private equity firm Permira abandoned a £842m bid for HMV after the chain turned down the approach. The offer was Permira's second bid for HMV - in February an offer of £672m had been turned down.